Happy Christmas to all, and to all a good turkey! SAN BERNARDINO, Cal., Dec. 25.—A large camp of brake-beam tourists just beyond the city limits is without a sumptuous turkey and chicken feast to-day only because the prompt action of Mr. and Mrs. George Delaney saved from the pot the entire stock of their poultry farm which had been given the tramps by their eight-year-old daughter Grace as a Christmas gift. Grace had just returned from a church service when a tramp wandered up to the door. The sermon had been preached from the text that it is better to give than receive. The child put it to the test by presenting the wanderer with her own pet rooster. He promptly sent all the other denizens of the "Tincan" camp for Christmas gifts, and the little girl continued applying her pastor's text through the medium of her parents' poultry. The Economist has an interesting article on the politics of census taking. Counting can be even more dangerous than being counted. In 1936 Stalin told his officials that the following year's census would find a total population of 170m—a figure that took no account of his slaughter of millions in famines and purges. But the enumerators found only 162m people, and also revealed other unwelcome facts, including that nearly half the population of this avowedly atheist country was religious. So Stalin denounced the count as a “wrecker's census” and had the census takers either imprisoned or shot. A new count in 1939 came up with a similar total, but this time officials wisely classified the results and gave Stalin his figure of 170m. Thomas Jefferson, on the other hand, was "so fond of enumeration that he once wrote to a friend that he had 'ten and one-half grandchildren, and two and three-fourths great-grandchildren', and that 'these fractions will ere long become units.'" One of the perks for Mark Van Vleet of being a lawyer for Fender Musical Instruments Corp. is meeting great musicians. Members of the famed Guinness brewing family had their DNA tested to confirm their ancestor Arthur Guinness's claim that he descended from the Magennis chieftains of Iveagh, in County Down. It turns out that he descended from "the subsidiary McCartan clan, a far less eminent family." The book [Arthur's Round: The Life And Times Of Brewing Legend Arthur Guinness] explains that where Arthur's genuine ancestors, the McCartans, once lived is a small village called Guiness or Ginnies. The name of which is derived from the Irish Gion Ais, meaning wedge-shaped ridge -- thus clarifying the roots of the famous surname. Craig's Christmas photo brings to mind terrifying Santa memories of my own. Isn't there one of these photos in every family album? We've concluded that most of Nancy's missing relatives were hiding under the porch when the census taker came in 1920 and 1930. You can try your hand at that challenge this weekend, or take a stab at this one. A Christmas card mailed in 1914 was delivered recently in Kansas. Little is known about the post card, which features a color drawing of Santa Claus and a young girl and is still in excellent condition. The card was addressed to Ethel Martin of Oberlin, who is deceased. The post office, however, wanted to get the card to a relative, he said. Who might her cousins in Nebraska have been? Florence Irene Ford died in 1871 at age ten, and was buried in Natchez City Cemetery in Mississippi. During her short life she was extremely frightened of storms and whenever one occurred she would rush to her mother to find comfort. Upon her death her mother was so struck with grief that she had Florence's casket constructed with a glass window at the child's head. The grave was dug to provide an area, the same depth of the coffin, at the child's head, but this area had steps that would allow the mother to descend to her daughter's level so she could comfort Florence during storms. To shelter the mother during storms, hinged metal trap doors were installed over the area the mother would occupy while at her child's grave. The glass window was walled off in the 1950s to prevent vandalism, but the metal doors still work. More photos here, here, and here. obituary forum has dubbed this the "Worst obit headline ever." I must agree. A caption on June 8, 1944, with a photograph of Army officers at mess on the Pacific front, misspelled the given name of the first officer seated at the left side of the table. He was Col. Girard B. Troland of New London, Conn. – not Gerand. The error was called to the attention of the editors by his grandson yesterday. Last week’s editorial had a major error in it that I must correct. I referred to my new granddaughter as three and one-half YEARS old. It should have read MONTHS old. Boy am I in trouble. Rudolph the Red-Nosed Reindeer has a profile at Genebase. He needs to do some work on his pedigree, though. "Rudolph's DNA "Rangifer tarandus" was sequenced by a group of scientists in 2005 (Genebank AB245426) - this is the real thing," said June Wong, Vice President, Laboratory Operations, Genetrack Biolabs. "Humans are genetically similar to many other creatures on earth, including approximately 85 per cent similarity to reindeer and surprisingly, 61 per cent similarity to the fruit fly." Note: Just because your grandfather or great-uncle had a red nose does not mean that he was related to Rudolph. It is far more likely that he was a circus clown. A circus clown with a chronic drinking problem. The most recent Genealogue Challenge has to be my favorite so far. We started out with an image of Faith Bacon as a striptease artist with a lackluster Hollywood career who ended up dead on a sidewalk in Chicago. What have we found out so far? Her great-great-grandfather, Daniel Dearborn Page, was the second mayor of St. Louis. Her great-grandfather, Henry Douglas Bacon, was a generous benefactor of the University of California at Berkeley. She was a not-too-distant cousin of General George S. Patton (it appears that her great-grandmother, Mary Catherine (Hereford) Cooper, and his maternal grandmother, Margaret (Hereford) Wilson, were sisters). She sent General Patton fan mail, and "included a photocopy of her Colonial Dames papers." She was a genealogist! At her death, she was separated from her husband, Sanford Dickinson, "song writer and publisher of Buffalo, NY." He seems to have been the music consultant for the cult-classic transvestite flick Glen or Glenda—the making of which was depicted in the movie Ed Wood. There are still details needing confirmation. Faith was living with her 28-year-old "sister" Charm Bacon in New York City in 1930. The 1910 census is difficult to read, but seems to show her father, Frank P. Bacon, with a 10-year-old bride, Charmaine. Was "Charm" Faith's mother? If so, what became of her? And where were they living in 1920? Contractor Bob Kitts found $182,000 in Depression-era cash behind the walls of a Cleveland house he was rehabbing for a friend. Now he and the homeowner, Amanda Reece, are heading to court to find out who gets the money. They traced the home's Depression-era ownership to a businessman named Peter Dunne, Kitts said. The money bundles had "P. Dunne" written on them, but no sign of its origin. Dunne apparently died unmarried and childless, leaving behind a mystery -- a fortune that would be worth an inflation-adjusted $2.7 million in today's money. This one has me stumped. Faith Bacon was a burlesque dancer who is said to have invented the fan dance. She threw herself from a window in Chicago in 1956. I found her in the 1930 census, but the trail quickly runs cold. What can you find out about Faith Bacon's origins? Five-year-old Tre Merritt bagged a 445-pound black bear while hunting with his grandfather. If you're having trouble finding a corset that fits at Wal-Mart, check out this MetaFilter post. Follow the links to find all the period attire you'll need to participate in next year's Pretend to Be a Time Traveler Day. James Watson—who helped discover the structure of DNA, and suggested recently that black people are genetically inferior to whites—has had his own genome sequenced. Based on Watson's own arguments, this means that he is 16 times more likely to say stupid things about race and intelligence than the average person of European descent. Doris Alman of Mason City, Iowa, was sent a postcard mailed by her parents to her grandmother back in 1968. Alman turned her attention to the envelope the card was mailed in, wondering who sent it to her. The No. 10 envelope has a one-line return address: Lost Postcard Rescue Dept. The envelope has a 41-cent Gerald Ford postage stamp and the postmark shows it was mailed from Brooklyn, N.Y., on Nov. 21, 2007. That’s where the mystery rests for Alman. Sound familiar? I blogged last January about a similar case in South Carolina. The envelope the card came in was postmarked in Brooklyn, N.Y., on Dec. 9. The return address is an e-mail account held by someone using the moniker "lost.postcards." [Ned] Hethington has e-mailed the account several times but has yet to receive a reply. Widow Fourth of Her Family to Die Suddenly on That Day. Who is (supposedly) pictured here, and in what city did her husband die? I have mixed feelings about this story. Jack Bacon, the pastor of an Oregon church, got a rare 1599 Geneva Bible as a Father's Day gift from his son, who had picked it up at a yard sale for a buck. Now he's selling the Bible off, page by page, to raise money for repairs to his church. "I opened the binding and found some hair. Wouldn't that be something if that was Pilgrim hair?" he asks. There are also burn marks, souvenirs of fireside readers, and mistakes from early printing presses, Bacon says. "Some of the lines slant down and then come back up," he says. Inside the distressed tome are messages in faded handwritten script that details births, deaths, marriages and other important milestones. He recently discovered a note from an early owner of the bible, Helen Crombie. "My daughter Jean Stephen was born June 26th one thousand seventeen hundred and twenty eight. Likewise my son William Stephen was borne July the eighth one thousand seven hundred and thirty years." The pastor's intentions are noble, but I can't help be reminded of the horrible practice of slicing up atlases and selling off the maps. Even a heavily damaged 1599 Geneva Bible is worth more than the sum of its parts. Though perhaps not enough cash to fix a church roof. Is seen riding a Segway? Is seen wearing bunny ears and playing guitar? Touts karaoke lounges as an ideal venue for computer talks? Describes genealogical cruising as “tasty, painless” and “not prison”? Suggests that all genealogical conferences should be done on cruise ships? An Arkansas man is searching for Confederate gold buried to finance a second Civil War that never happened. The Freemasons, John Wilkes Booth, and Jesse James were all involved. Bob Brewer was 10 when his great-uncle, W.D. "Grandpa" Ashcraft, pointed it out on a logging trip 57 years ago. "He said, 'Boy, you see that tree? That's a treasure tree,'" Brewer recalled on a recent visit to the site. "'You see that writing? If you can figure out what that is, you'll find some gold.'" Once, when I was a naive lad of 37, I allowed anyone to comment on this blog. After a particularly heinous spam attack, I began restricting comments to registered Blogger members. This always bugged me, because not everyone has a Blogger account. I know that some of my regular visitors have registered for the sole purpose of leaving comments on this and other Blogger blogs. 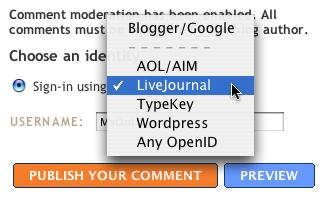 So I am very happy that Blogger is testing OpenID-based commenting. When leaving a comment on this site, you can still sign in using your Blogger/Google account, but now you can also use your AOL, LiveJournal, TypeKey, or WordPress account. If you have a blog or website that doesn't support OpenID, it's pretty easy to set it up. Once it's configured, you can just type in your website's address to sign in to any site that uses OpenId for authentication. About 8% of men in Central Asia inherited their Y-chromosome from Genghis Khan, which means that roughly a gazillion people have the Mongol ruler in their family trees. Michael Stusser—author of The Dead Guy Interviews—snagged a sit-down with the prolific potentate. Scottish postmaster Jonathan Creed tore down a partition at his office and found a creepy message written behind. Imitating an inscription more commonly found on a gravestone it read: "In loving memory of John Tooties Q.C. who died on the 12th Day of March. Foul Play Suspected. 1958. 4ft below he lies." Jonathan found himself faced with the horrifying prospect that a murder had been committed, possibly on his premises, with the victim buried deep beneath his floorboards. An investigation turned up the "victim": 70-year-old John "Tooties" Sutherland, who worked on a construction crew as a young man. [O]ne of their favourite pastimes was to scrawl messages on plaster or walls which were going to be covered by wallpaper or partitions. Here's a book for the genealogist who has everything but this book: Larry Ashmead's Bertha Venation and Hundreds of Other Funny Names of Real People. William Shakespeare was moved to ask, "What's in a name?" Well, in the case of Lavender Hanky, Hedda Lettuce and Stan Dupp the answer is a hearty chuckle. Not to mention poor old Dwayne, the son of Mr and Mrs Dwopp, who must be rather tired of hearing "Dwayne Dwopps keep falling on my head" every time he enters a room. Another from the book: Nancy Ann Cianci (her last name pronounced See-Ann-See). She's a real person (the ex-wife of former Providence Mayor Vincent "Buddy" Cianci), but Dwayne Dwopp? I'm skeptical. Donald Harman Akenson's new book—Some Family: The Mormons and How Humanity Keeps Track of Itself—gets reviewed in today's Globe and Mail. It's going on my Christmas wish list. "The Saints," [Joseph] Smith wrote in 1840, "have the privilege of being baptized for those of their relatives who are dead, whom they believe would have embraced the Gospel, if they had been privileged with hearing it." This sent the faithful back to their family Bibles for the names and dates of their ancestors. The great genealogical treasure hunt had begun. In 1918, the Mormons expanded their mission, trawling for names among non- Mormons and baptizing them once their exact place in the tree of life had been determined. The practice continues to this day, spurred on by the wish to save as many souls as possible. Egyptian tour guide Kahled Makram found a bag in the Sahara dropped by Alec Ross when he was serving there in World War II. Ross died a few years ago, but Makram is sending the bag to his sister, Irene Porter. She has been able to read the letters - sent by her parents, herself and her brother's two girlfriends - from photographs put onto disc by Mr Makram. Mrs Porter, 75, of Burnley, said: "I was stunned when I found out about this and it is just incredible the way the bag has come to light. "I just wish the bag had been found a few years earlier so that Alec could have been reunited with its contents.